Sometimes insight and inspiration come from an unlikely place. Recently, I was invited to join the Facebook page for my high school’s 50th reunion, which is next year. As expected, it was fun hearing from those voices from the past, though I believe the Facebook connections were only a small fraction of the 1100 graduates in our class. My high school, Brooklyn Technical High School, or Tech, as, we called it, was a specialized high school that drew its students citywide and required a test to get in. I guess Tech was one of the forerunners of today’s magnet schools. Tech’s curriculum was designed to prepare us for entry into the technical industries with course majors in aerospace, electronics, chemical engineering, etc. It was rigorous and it was tough. And, hell, I was one of those geeks running around with a pocket protector with a six-inch steel ruler clipped to it, and a slide rule clipped to my belt (and I wasn’t teased for it because that was the norm). One of my classmates made a comment that he noticed during a visit to the school that the foundry classroom had been converted into a storeroom. Foundry was one of those classes that was supposed to prepare us for a technical career. It was a shop class on how sand molds were made to cast steel parts. We also took another class called Industrial Processes that covered how metals, wood, and plastics were processed in industry. This was all part our training to ready us for a technical career in the 1960s. One highlight of the Industrial Processes class was a road trip to a Bethlehem Steel plant in Pennsylvania to view in operation the open hearth and electric arc furnaces that fabricated steel and steel parts. Even though low-cost imports were just beginning to come in from Japan, the plant was still a thriving, busy facility. My classmate’s comment about the Foundry class struck me immediately as a metaphor for what has happened in the US in the last three or four decades. 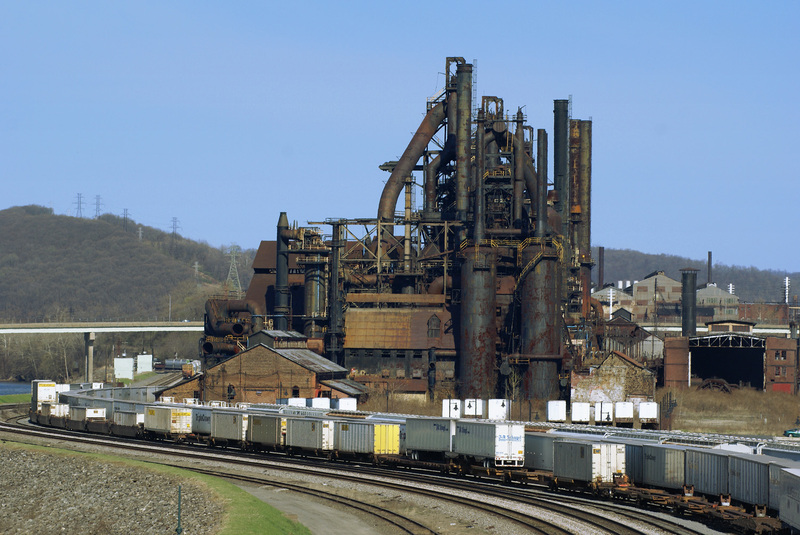 I wondered about that Bethlehem steel plant and did a quick Google search, only to learn that the company had gone bankrupt in 2001. The plant that I had visited is now a Sands Casino (according to Wikipedia). I’m now living in a Buffalo suburb. There are many old red-brick buildings in Buffalo and Lackawanna that reminded me of the buildings at that Bethlehem steel plant. These, too, used to be factories and manufacturing facilities employing thousands of people in well-paying jobs. They are now apartment lofts and museums. Yes, SolarCity is building a new plant here that will supposedly hire 1460 workers, but that is a shadow of what industry used to employ here. There is an effort to fund biomedical startups, but no one is under the illusion that we’ll be able to match the employment of my parents’ generation. Too many of the grandkids of the workers from those old plants now have far fewer opportunities and good paying jobs in manufacturing. Maybe they can get jobs at some of the local call centers (if the centers haven’t all moved to India) and as healthcare workers taking care of their grandparents. Unfortunately, many of those jobs don’t involve benefits. So, do you think this isn’t part of what’s powering the churn and disruptions in this year’s election? While browsing Tech’s website, I discovered the method for students to choose their majors had been changed. In the sixties, you simply chose your major. Today’s it’s a process that involves something called the Power Index (PI), where each student is ranked according to his or her academic average, with some weighting on a couple of critical courses. Students then go online and list their choice of majors in order of preference. Those with the higher PI get their first choice, etc. Why is this process necessary? I think you can guess. I bet most of the students probably want to go into computer science. Well, why not? That’s where the money is these days. Unfortunately, the tech industry has not come close to filling all those abandoned red brick building with jobs. Not when they make their hardware, and even their software, overseas. The method of major selection is also a metaphor for today’s data driven society. At one place I worked, I was forced to rank the engineers reporting to me. The bottom 10% were mandated to be graded as Needs Improvement, even if their work was satisfactory. This was in line with Jack Welch’s philosophy of ranking all workers and firing the bottom 10% every year. Today, workers are commodities that can be discarded. Yes, I know that to manage something you need to measure it first. At least that’s the theory. Problem is, people aren’t cogs. I remember being told, “Don’t worry, even if the Japanese take over the steel and auto industries, we still have electronics.” Then a decade later, we were told, “Don’t worry about the electronics manufacturing plants that are being moved to Korea and Taiwan, because we still have the software and engineering.” Then a decade later we were informed of the research and engineering centers being opened in China by our transnational corporations. And, so it goes. Add the impact of automation on manufacturing and the future of those kind of jobs here looks rather bleak. The rise of Trump and Sanders in this election season comes as no surprise to me. A century ago, William Jennings Bryan led a populist revolt against industrialization. He lost, but there was a future of industrial jobs created during the Industrial Revolution that helped mitigate the transition. The Information Revolution has not supplied the equivalent number of replacement jobs and is diligently working to eliminate more of them with automation. So what’s next? Tell me what the future will be for my grandkids? This is the first in a series of blogs addressing this issue. A few days ago I was doing my usual finger exercises with the cable remote when I stumbled on a Charlie Rose interview with Larry Summers, the former Clinton Treasury Secretary and former Head of Obama’s Economic Council. I listened for a few moments and was about to continue with my finger exercise when something Summers said caught my attention. If you were to look at income distribution (i.e., how income is divided among the population) in the United States, and compare the division now to what it was in 1979 you would find something very troubling. If the distribution today was the same as it was in 1979, 80% of the population (mainly the middle classes) would have $1trillion dollars more than it currently has, and the top 1% would have $1trillion less. This comes to about $11,000 per family for the 80%. In discussing the causes of a slow-growth economy and income inequality, Dr. Summers pointed to the lack of demand as the cause, not lack of supply. And, yet, since the time of Ronald Raegan, the emphasis on the government’ response to the economy and its problems has increasingly been on the supply side of the economic equation, with neglect of the demand side. A prominent economic theory in politics today seems to be that tax cuts for the rich and for corporations are the only way to stimulate the economy. The old concept of the so-called law of supply and demand seems to have been displaced by new schools of economics discounting the demand side as being unimportant. In fact, it is argued that anything done to help the demand side will negatively impact the economy. For example, think about the arguments against increasing the minimum wage. Today the focus is on supply side of economy, i.e., the rich and corporations, to the neglect of the demand side. We do this in spite of the acknowledged fact that the economy is 73% consumer driven. Where does consumer spending fall? On the demand side of the equation. Why the focus on one side? How did this situation arise? Part of it, has to do with taxes. Everyone hates them. So a theory that purports to improve everyone’s wealth by cutting taxes is very appealing. In other words, it appears elegant. What does it mean for a theory to be elegant? In the vernacular, it means it’s “cool.” It also means it’s simple. In physics there was an argument over the duality of a physical entity. Is light a wave or a particle? Big names in physics were divided on each side of the argument. Isaac Newton was the biggest proponent of the particle approach with his so-called corpuscle theory. On the other side were Rene Descartes, Robert Hooke, and Christiaan Huygens, all well-known physicists and mathematicians in their own right. The apparent nail in the coffin to the particle theory came in the mid-19th century, when in 1865, James Clerk Maxwell, the brilliant Sottish mathematician and physicist published a series of equations known, not surprisingly, as Maxwell’s equations. These equations described light as a wave made up of electric and magnetic fields, the so-called electromagnetic waves. Not only were the equations extremely elegant, but they seemed to explain all the aspects of light, such as refraction, diffraction, reflection, etc. Within a decade or so Maxwell’s equations had been anointed as the as the answer to the centuries-old argument by virtually every physicist. Elegance and simplicity (at least to a physicist or mathematician), just like supply side economics. Then a strange thing happened. While conducting experiments to further verify Maxwell’s laws, Heinrich Hertz accidentally discovered that light can stimulate metals to emit electrons, the so-called photoelectric effect. A seemingly small and unimportant discovery that was to change the world. Solar cells are a prime example of the application of the photoelectric effect. They produce electricity when exposed to sunlight. Not only did Maxwell’s Equations not predict the effect, but when applied in the right manner, they predicted the wrong answer. According to Maxwell’s Equations, varying both the wavelength (we see it as color) and the intensity of the light would change the rate of electron emission. In other words, shine a brighter light on the metal and more electrons should be emitted. Only that isn’t what occurs. Instead, the electrons only respond to the frequency of the light, not the intensity. There was a threshold frequency for each metal below which electrons were not emitted. So the Maxwell slam dunk was suddenly derailed. His equations no longer described every aspect of light. For the next two decades, physicists searched for an explanation. It took Albert Einstein to provide the solution. His solution required light to act as a particle with a discrete energy based on the light’s frequency (color). But Einstein went a step further. He argued that light was both a wave and a particle and could act in either sense depending on the application. In other words, light consisted of photons that also acted as a wave. Einstein was awarded the Nobel Prize in 1921 for the photoelectric effect. His 1905 paper on the photoelectric effect started a revolution in physics that eventually led to the Quantum Theory (which, in turn, led to inventions such as lasers and electronic semiconductors.) So, in reality, both sides of the argument of the nature of light were right. In some cases you could use the Maxwell’s wave equations and would be correct. In other instances, you needed to use the particle aspect and Quantum Theory. For the last three years US corporate profits have been the highest they’ve been in a long time but with minimal job creation (when compared to the increase in profits) and certainly no wage growth for the middle class. One company reported its highest profit in history and still continued to lay people off. We hear the same old arguments. Cut taxes and cut the budget. Forgo investments in our infrastructure. Keep wages suppressed. We’ve seen some recovery but not nearly what should expect at this time after a deep recession/mild depression. We have a couple of on-going experiments now occurring that should shed some light on this (please excuse the pun). Kansas and Wisconsin. In Kansas we’ve had an extreme case of tax cuts for the wealthy. State budget deficits abound and the economy is lagging the nationwide in its recovery. In Wisconsin, we’ve had a less extreme but still an energetic application of the supply side-only application. When both are compared to Minnesota, which had a more balanced approach, they are significantly lagging Minnesota’s growth numbers. Are these the equivalent in economics to the photoelectric effect? Is it time for a more balanced theory and approach? We need a more balanced approach, one that accounts for both supply and demand. We need a change in thinking. Albert, where are you when we need you?